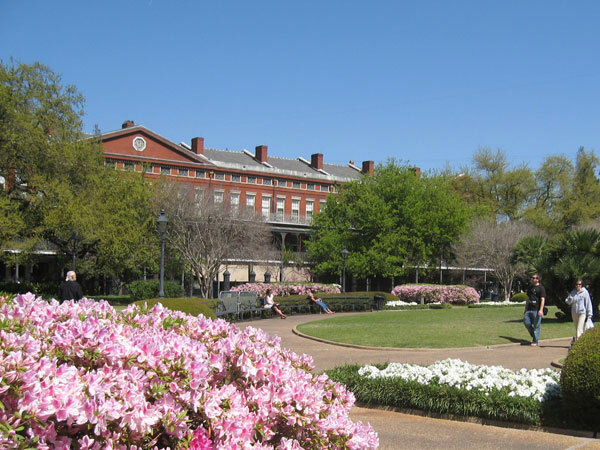 Situated between the oldest continually operating cathedral in the United States and the city's peaceful riverfront, Jackson Square serves as a gateway to all New Orleans has to offer. Designed in the image of Paris's oldest planned square, the Place des Vosges, the iron facades surrounding the square blend seamlessly into the old Spanish city hall, creating a uniquely New Orleans feel. Grand walkways wrap around the central statue of President Andrew Jackson, for whom the square is named, leading pedestrians to the French Quarter's alleyways and the waterfront "Moonwalk." Square is bounded by Chartres Street to the northwest; St. Anne Street to the northeast; Decatur Street to the southeast; and St. Peter Street to the southwest. 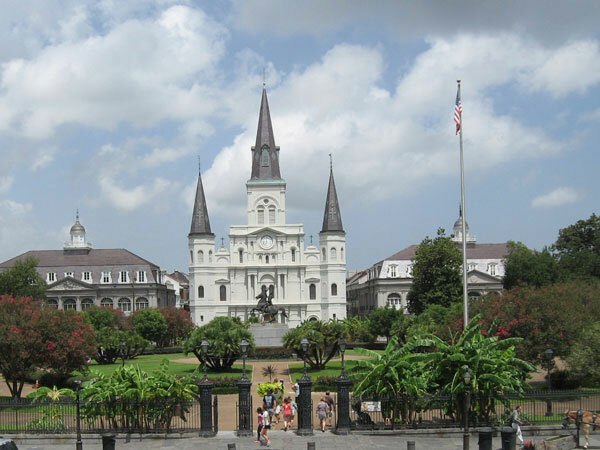 Lying in the heart of Adrien de Pauger's 18th century plan for New Orleans, Jackson Square is the cornerstone of the city's strong planning tradition. As the center of nation's first municipal historic district, as well as the first business improvement district, the square has been constantly improved by colonial generals and modern mayors alike, while still preserving its historic features. 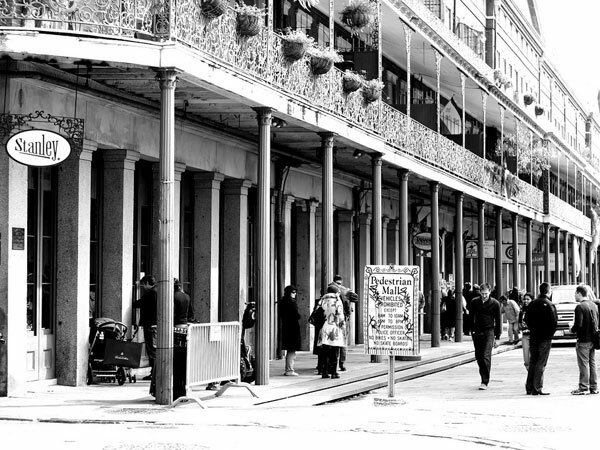 From 18th century military parades to the 2010 season kick-off party for the Super Bowl Champion New Orleans Saints, Jackson Square has remained a hotspot of civic activity for nearly 300 years. Jazz musicians, street artists and the world-famous Café du Monde continue to attract locals and visitors every day to the festive atmosphere of the square and adjoining streets created by Tarot-card readers, living statues, hotdog vendors, magicians, musicians, and artisans. Jackson Square, seen from Decatur Street. In the background is the famous St. Louis Cathedral on Chartres Street. Photo courtesy Jeniece Black, New Orleans Department of Parks and Parkways. Baroness Pontalba hires architects James Gallier and Henry Howard to design Parisian-style apartments along St. Ann and St. Peter streets (1850); said to be oldest apartment complexes in U.S.
Jackson Square reflects the design of Paris's oldest planned square, the Place des Vosges, including such features as grand walkways, garden landscaping, and fountains. Photo courtesy Jeniece Black, New Orleans Department of Parks and Parkways.